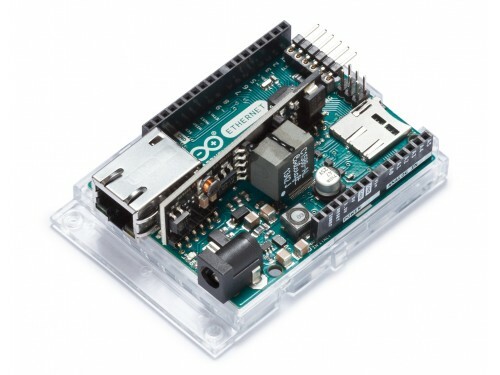 An Arduino Uno incorporating a WizNet W5100 TCP/IP Ethernet Controller. 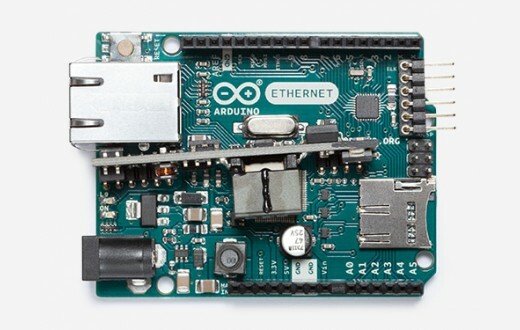 The Arduino Ethernet is a microcontroller board based on the ATmega328. It has 14 digital input/output pins, 6 analog inputs, a 16 MHz crystal oscillator, a RJ45 connection, a power jack, an ICSP header, and a reset button. NB: Pins 10, 11, 12 and 13 are reserved for interfacing with the Ethernet module and should not be used otherwise. This reduces the number of available pins to 9, with 4 available as PWM outputs. An optional Power over Ethernet module can be added to the board as well. The Ethernet differs from other boards in that it does not have an onboard USB-to-serial driver chip, but has a Wiznet Ethernet interface. This is the same interface found on the Ethernet shield. An onboard microSD card reader, which can be used to store files for serving over the network, is accessible through the SD Library. Pin 10 is reserved for the Wiznet interface, SS for the SD card is on Pin 4. The 6-pin serial programming header is compatible with the USB Serial adapter and also with the FTDI USB cables or with Sparkfun and Adafruit FTDI-style basic USB-to-serial breakout boards. It features support for automatic reset, allowing sketches to be uploaded without pressing the reset button on the board. 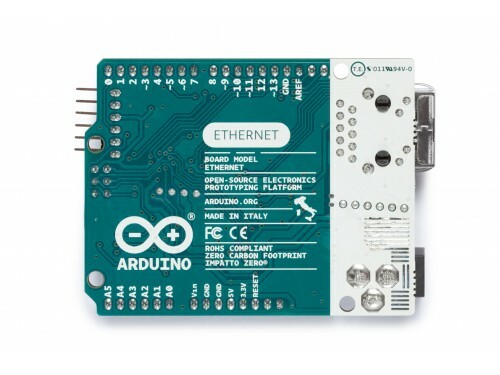 When plugged into a USB to Serial adapter, the Arduino Ethernet is powered from the adapter. the IOREF that allow the shields to adapt to the voltage provided from the board. Shields that use the IOREF pin will be compatible both with the board that use the AVR, which operate with 5V and with the Arduino Due that operate with 3.3V. Next to the IOREF pin there is a not connected pin, that is reserved for future purposes. 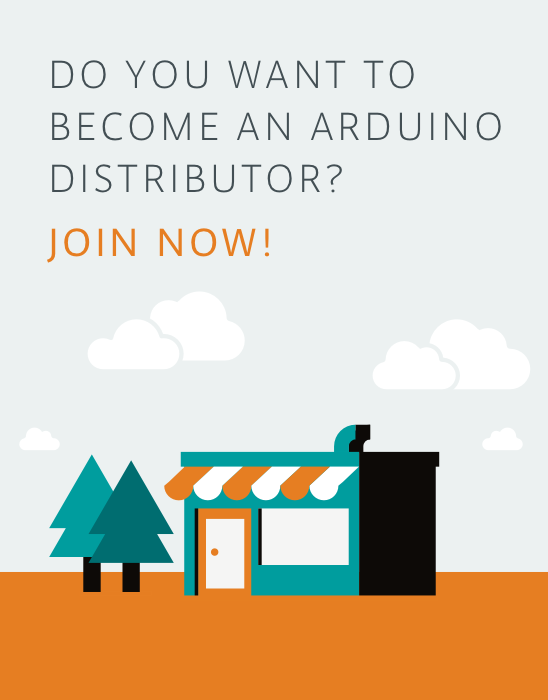 Use the Arduino Software (IDE), and start to tinker with coding and electronics. You can find your board warranty information here. This version has the power-over-Ethernet (PoE) module soldered to the board to provide power from a conventional twisted pair Category 5 Ethernet cable. It is IEEE802.3af compliant, and works with all compliant PoE injectors currently available. 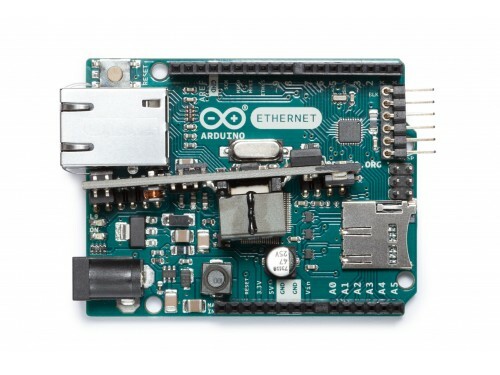 NB: the Power over Ethernet module is proprietary hardware not made by Arduino, it is a third party accessory. For more information, see the datasheet When using the power adapter, power can come either from an AC-to-DC adapter (wall-wart) or battery. The adapter can be connected by plugging a 2.1mm center-positive plug into the board's power jack. Leads from a battery can be inserted in the Gnd and Vin pin headers of the POWER connector. The board can operate on an external supply of 6 to 20 volts. If supplied with less than 7V, however, the 5V pin may supply less than five volts and the board may be unstable. If using more than 12V, the voltage regulator may overheat and damage the board. The recommended range is 7 to 12 volts. SPI: 10 (SS), 11 (MOSI), 12 (MISO), 13 (SCK). These pins support SPI communication using theSPI library. LED: 9. There is a built-in LED connected to digital pin 9. When the pin is HIGH value, the LED is on, when the pin is LOW, it's off. On most other arduino boards, this LED is found on pin 13. It is on pin 9 on the Ethernet board because pin 13 is used as part of the SPI connection. The maximum length and width of the Ethernet PCB are 2.7 and 2.1 inches respectively, with theRJ45 connector and power jack extending beyond the former dimension. Four screw holes allow the board to be attached to a surface or case. Note that the distance between digital pins 7 and 8 is 160 mil (0.16"), not an even multiple of the 100 mil spacing of the other pins. Easily prototype your Uno projects with the Proto Shield. Drive high-power load devices through four relays, rated up to 30V DC 2A.